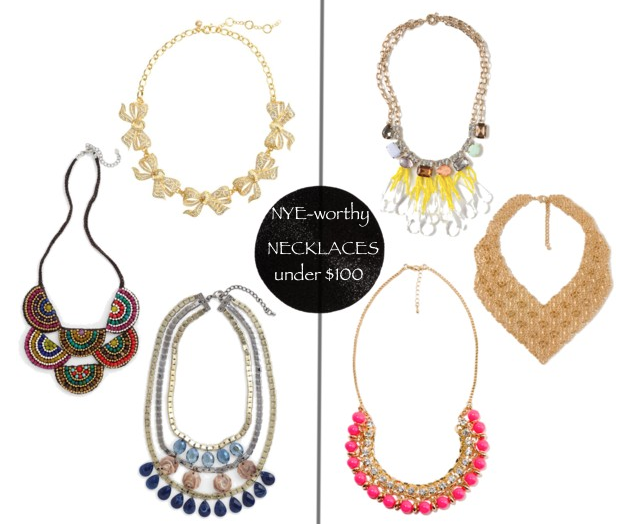 Necklaces are my favorite way to dress up an outfit-- especially when it comes to New Years. I recently snagged the bow necklace (the top-left from below) on sale at my local J.Crew store for only $48! It's sold out everywhere online, and down from $148, I thought it was a great deal. I've seen a few more in the store lately, because some are getting returned from Christmas... why, I'm not sure, because it is a really great statement piece. Any of these pieces below are under $100 (some even below $25!) and would look perfect paired with a simple LBD or even a more colorful outfit on New Year's Eve. Either way, make sure to have fun with it-- that's the best part about NYE. the last one is amazing, great necklaces honey! congrats to your great bargain! I LOVE the pink one! Great pieces!